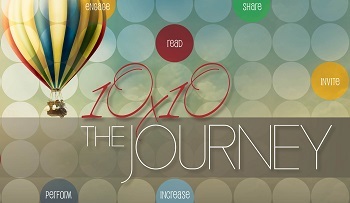 The Journey is a 10-month (Feb-Nov) congregational spiritual growth tool based on John 10:10. The congregation will experience teaching on the monthly topics and be challenged to take part in transformational disciplines. More than 1,500 people have taken part in this process in 25+ churches. If you are interested in signing up, or would like more information, check out the website at http://thejourneyof10x10.org/. The Journey will launch conference-wide in January of 2016. Click here to sign up and order your participant guides.